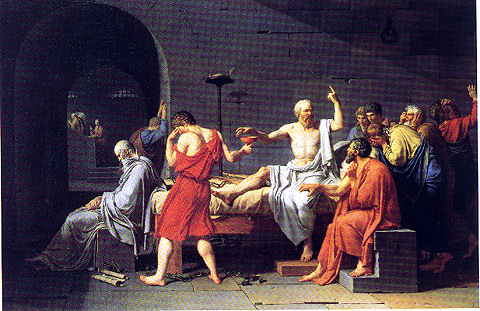 Jacques Louis David's monumental painting portraying the death of the Greek thinker (which appears on the cover of this book). Provides also a brief description of the painting and artist, as well as an overview of the scene being portrayed and the significance of Socrates and the manner in which he led his life and influenced others. This is one page on the Adult Education for Citizenship and Democracys website, a new learning programme exclusively concerned with the promotion of democracy and active citizenship. It is part of the Popular Education for Democracy and European Citizenship project which is supported by the Socrates Programme of the European Union. To browse a selection of some of Socrates better-known quotes, click on this page and watch his words of wisdom scroll across your screen. A good basic starting point to obtain general information on Socrates, his education, his teachings and his times. Contains links to a number of articles on the philosopher himself, on his beliefs, on the Socratic method, and on biographers and scholars. Articles are concise and written in laymans terms, yet serve as a solid foundation from which to delve deeper into study of Socrates, how he was influenced and who he in turn influenced with his thinking. For a nice tutorial on reading on reading the Euthryphro, Apology, Crito and the death scene from the Phaedo, heres analysis and insight into the characters and the situation in each of these classical pieces of literature. However, anyone interested in reading these particular works should visit this site which contains annotated hypertext versions of Platos most important Dialogues, and audio clips of some of the texts. Included are definitions and background information on particular concepts, characters and words, as well as photographs and maps to transport you to the particular time and place in focus. Notes are available on a sidebar to clarify and highlight the deeper nuances in the texts. Finally, test your knowledge on the works presented with a quiz that is available on the site. By searching on the term Socrates, this sites search engine turns up more than 350 articles and texts related to the great philosopher. Complete in its nature, it includes references and links to definitions of words appearing in the texts and more. Archived are full hypertext versions of Platos Dialogues: The Crito, The Phaedo, The Phaedus, The Symposium and The Republic, as well as an overview of Platos life (including important influences such as Socrates) and a substantial bibliographical listing. With this abundant information, the site meets its goal of producing an interactive learning environment that uses technology to enhance the study of Plato in ways previously unavailable. According to the columns introduction, Having returned from the turn of the fourth century BC to the turn of the twenty-first AD, Socrates has eagerly signed on as a Philosophy Now columnist so that he may continue to carry out his divinely-inspired dialogic mission. Following along the lines of the Dear Abby column, this webpage replaces Abby with Socrates, answering readers questions in only the way Socrates would. The Dear Socrates column appears on the Philosophy Now website (the news-stand magazine for everyone interested in philosophy) and allows readers to submit their own questions to the famous philosopher-turned-columnist. One of the best interactive sites available on the Internet regarding ancient Greece. Spun off of the PBS documentary  The Greeks: Crucible of Civilization  this website contains an organized, visually appealing and hi-tech presentation of information. Included is a timeline, spanning from 1400 BC at the founding of the Oracle of Delphi, through the eras of Cleisthenes, Themistocles, Pericles, Aspasia and Socrates, and ending at 337 BC when Athenian democracy came to a close. Most notable is the 3D animated footage of the Parthenon and Acropolis, and audio capability which allows the user to hear how the ancient Greeks spoke. Dont forget the five-part questionnaire, which helps users gauge their would-be rank and profession in Athenian society based on family background, gender, work experience and other key determinants of status. An excellent links page, found under Educational Resources completes this hi-tech site and includes a selected bibliography, student-friendly websites, lesson plans, and other links that help to define and illustrate the culture, society, politics, economy and all other realms of ancient Greek life. For the full effect, download Quick Time Player and an audio player of your choice to your PC. interactions through time, space, and language, and is part of the Department of the Classics at Tufts University. Perseus achieves its primary goal of bringing a wide range of source materials to as large an audience as possible and seeks to inspire inquiry into and further discoveries related to the classical world. The Perseus site contains a search capability, as well as an index of classical authors  including Plato and other contemporaries of Socrates. Within each search generated are links to definitions, photos, bibliographical references, and more. Contains also hypertext versions of classical works. In addition to the websites exhaustive search capabilities are links to a Greek history overview, arts and architecture catalogs, and more. Bringing the wisdom of the classics to the Internet since 1994, this archive boasts a selection of 441 works of classical literature from 59 different authors, primarily from the Greco-Roman world. Also includes links to other classical and electronic text resources and reader-recommended websites for each work that is available. the millennia of artistry, the centuries of outstanding art, the achievements of the human spirit, the routes on which the western civilization strode in order to reach its current form. The site achieves a dual purpose by listing descriptions, photos and hundreds of links to important museums, artwork, maps, monuments, archaeological sites, while also providing contact information and hours of operation for many of these historic landmarks. While all periods are touched on, the Classical Hellenic period is complete and worth exploring. To see how the world looked back in the times of Socrates and his contemporaries, this website is the tool to use. The AWMC is an online atlas of the ancient Mediterranean world designed for a broad cross-section of groups interested in the study of the classics: from high school students and teachers through the university level and beyond. Notably, the site allows you to download and print high resolution maps from the ancient world. But the site doesnt stop there. Also included are links to news and events, published work, and other ancient world map sites on the Internet. Among the most complete and organized index of significant links to the Classics on the Internet. Headings under which links are categorized include: information gateways; databases and information servers; electronic publications; bibliographical indexes; images; course materials; fonts and software; professional organizations; on-line seminars; K-12 resources; e-text archives; classics departments; discussion groups and others. Hosted on the University of Michigans website, this online index boasts hundreds of links related to the Classics and Mediterranean archaeology. It is a links only website, providing information under the categories of: texts/projects/journals/bibliographies; indexes of links; exhibits and image sources; field reports and archaeological site pages; associations and organizations; departmental descriptions; course material and teaching resources; museums; atlases and geographic information; news groups and mail lists; and more. Look here to access the online catalogue of fashion in ancient Greece and the surrounding world. This website compiles the hottest links on the Internet that display clothing for men, women and children for all different occasions. Links are conveniently listed on the homepage, and are filed under the categories of: general information (including history); womens dress; mens dress; textiles; theater costume; armor and weapons; jewelry and accessories; hair and headdress; cosmetics; and related information. This site also incorporates an online bookstore focusing on costume-related books from all eras. a must-visit for those interested in the debate on the Parthenon Marbles currently being waged between those who view Greece as their rightful home, and those who believe the frieze should remain at the British Museum. Also available is the COMPASS online database of nearly 5,000 objects on display at the British Museum, including artwork and artifacts from ancient Greece. Available via the Greek Ministry of Cultures website  www.culture.gr  this link lists and describes the various exhibits housed in this renowned museum, along with photographs of selected artwork and artifacts. The museum is described as the most important archaeological museum in Greece and one of the richest in the world concerning ancient Greek art. Its collections are representative of all the cultures that flourished in Greece. With this in mind, the website is an important one to visit for a preview of what the museum has in store for its virtual and real visitors. See also http://dboals.virtualave.net/archath1.html for online photographs of exhibit items. Includes photos from a selection of ancient Greek works on exhibit at the renowned Louvre Museum in Paris. Art is categorized chronologically, with eleven pieces of art displayed online from Socrates era. Also offered is a description of how the artwork in this particular collection was acquired, a basic map of the Mediterranean world, and other pertinent information about the collection. Images presented are from the personal slide collection of Kevin T. Glowacki and Nancy L. Klein of the Department of Classical Studies at Indiana University, Bloomington. Now the largest of fourteen foreign advanced research institutes in Athens, the American School of Classical Studies in Athens website contains general information, publications, a school directory, a listing of school-related excavations and surveys, fellowship and grant information. It is targeted primarily at scholars and those interested in researching the classics. Its stature as the first and largest American Overseas Research Center in terms of assets, programs, and constituency makes it a worthwhile place to visit on the Web. Classics Resources is essentially a no-nonsense links page that can take you to most places you would want to go on the Internet involving the Classics. Links fall under the following headings: general classics listings; texts  general; specialized sites; Greek language; Greek authors; maps/sites  ancient world; Classics e-journal; PERSEUS resources; Classics departments; E-list archives; Latin-related sites; Classics publishers; Classics associations; and other pages of note. To join in an online chat or discussion related to Greek and Latin civilizations, log into one of the moderated sessions hosted on this site. Also included are related job listings, grants, scholarships, events and conferences. The webpage is simple and straightforward. website. The EAWC strives to demonstrate the modern-day importance of studying ancient cultures, and achieves that goal with links to a number of ancient civilizations, among which is included that of Ancient Greece with a specific reference to Socrates and the social organization of Athens during his time. This website hits all the major philosophers of the ancient Greek world. The value of this website is in its drawing together a diverse array of ancient civilizations. With this picturebook glimpse across history and cultures, the reader can compare and contrast each of the civilizations from one virtual vantage point. Cultures that can be explored on this website include: Ancient Near East; Ancient India; Ancient Egypt; Ancient China; Ancient Greece; Ancient Rome; Early Islamic World; and Medieval Europe. The Ancient Greece site provides an excellent overview of the environment in which Socrates lived. It doesnt stop there, however. This site includes information, photographs and web links on the broad topics of: art and architecture; geography; mythology; people; history; Olympics; wars; and other resources to help the user form a complete image of the various facets of daily life in ancient Greece. Also useful is the sites online bookstore, presented in association with Amazon.com. Books can be browsed by general topic area, or plug your key words into the Amazon.com search engine. The Ancient Greek World challenges the viewer to discover the story of life in ancient Greece. This online resource from the University of Pennsylvania Museum of Archaeology and Anthropology will transport you back in time by detailing daily life in this ancient world culture through the use of images and essays. The artifacts on display vividly depict daily ancient Greek life by examining four subcategories: Land and Time, Daily Life, Economy, and Religion and Death. Land and Time: An overview of the physical landscape and climate of ancient Greece, and a timeline of important events. Daily Life: Covers all aspects of daily life in ancient Greece, including home life, facets of both womens and mens lives, and roles at home and in society. Economy: Includes photos and explanations of various coins, a description of the means of exchange in society including an overview of trade and manufacturing, goods traded, and the significance of pottery in the whole process of exchange. Religion and Death: Provides an overview of ancient Greek religious beliefs and customs. Interestingly, this portion of the site details the conception of the afterlife during those times. This chapter from Marilyn Katzs book, The Cambridge Illustrated History of Ancient Greece, provides a detailed representation of life in ancient Greece. Among other things, Katz tackles the difficult question of gender roles in society during those times. While art and literature may portray the social ideal as consigning men to the public realm and women to the private realm, she points out that when we examine more closely some of the details of ancient Greek social and cultural practices, the reality looks quite different. Also discussed are the polis, the legal system, social classes, the agora and trade, drama, demographics, and home life and the role of men, women and children in these realms. This site complements The Ancient Greek World site well in its focus on daily life. A frequently referenced site on the Internet, this teaching and learning tool is targeted at middle school students (ages 11-14) and urges investigation of Greek civilization of the Classical period. food; sports (the Olympics); science; art; architecture; suggested books on Greece; crafts and projects; teachers guided; and gifts about Greece. To hear fragments of music enjoyed during the times of the ancient Greeks, explore this site and tune into one of more than 20 musical melodies. This site also contains a link to Homeric Singing and Classical Greek Pronunciation, which will help you to better envision what Socrates and his contemporaries heard and spoke. A fascinating compilation that transports the surfer back thousands of years. Navigate your way to this site for a consolidated listing of ancient Greeces most important thinkers, from Homer to Aristotle, including a brief overview of their lives and significance as well as links for further exploration. For the arts and culture aficionado, or those simply interested in enjoying the Classics in a modern stage, visit the Didaskalia website. Didaskalia  an English-language electronic publication about Greek and Roman drama, dance and music in todays world  publishes listings and reviews of performances, conferences and other events. These keep readers informed of forthcoming events, but also as a valuable historical archive. The site provides a capability for online submission of upcoming events and reviews as well. The website was created in association with the Drama Committee of the American Philological Association, with its name taken from the inscriptions used to record the outcomes of drama and music festivals in Athens. Didaskalia is the recipient of numerous web awards for content and theme, and presents a very well-organized, easy to follow format. publication of texts related to the ancient world and the classical tradition. For those looking to have their work published, to contribute to an electronic publication underway, or to view currently available texts, the stoa.org is an excellent resource and channel for achieving any or all of these objectives. Diotima, part of the Stoa Consortium, is a resource dedicated to the study of women and gender in the ancient Mediterranean world. It includes course materials, a searchable bibliography, and links to many on-line resources, including articles, book reviews, databases, and images. The name of the site is borrowed from a reference made in Platos Symposium where Socrates claims to be passing on to his friends what he has previously learned about Eros from a woman named Diotima from Mantinea. Hosted on the University of Washingtons website, this provides a quick lookup of the Greek alphabet, including the letter (capital and lowercase) in Greek, the sound and name of the letter. Hellenic cultural traditions, and to promote Hellenic spirit and history as a reference point and source of inspiration for the present and future. The Foundation of the Hellenic Worlds mission closely parallels that of the Socrates project, and links provided on the Foundations website help to fulfill both project missions. Of note is a 3D and Virtual Reality link that reconstructs Hellenic architectural monuments and sites that today are either non-existent or in ruins. ancient and medieval Internet. This search engine for the ancient world was developed and is maintained by Anthony F. Beavers and Hiten Sonpal at the University of Evansville, with an impressive array of associated sites including, among others, Cambridge Classics, Exploring Ancient World Cultures, the Perseus Project, and Diotima. A special page hosted on the Scientific American magazines website, Restoring Virtual Ruins displays the work of The Museum of Reconstructions, a non-profit organization formed in 1995 to use cutting-edge 3D computer modeling methods to recreate lost or damaged works of art and architecture. Of note are the fruits of the organizations recent collaborative efforts with archaeologists at Princeton University and at the Greek Ministry of Culture to virtually restore the gateway leading into the Athenian Acropolis. The Museum of Reconstructions hopes that visitors to their site will soon be able to stroll online through their virtual reconstructions. It will be worth keeping an eye on. The Examined Life, philosophy and interdisciplinary search engines, a listing of philosophy events and a downloadable database of quotations from famous and not-so-famous philosophers. Visit the website of the the principal learned society in North America for the study of ancient Greek and Roman languages, literatures, and civilizations. Among the APA sites notable offerings is The Agora, an online listing of interesting links useful to anyone interested in what the Classical Greek and Roman world has to say to modern America. Also included is a page with links to North American and international associations and research institutes devoted to the classics, journals, selected sites, and a listing of lectures and conferences among many other offerings.